This has got to be one of the coolest direct mailer I have seen so far for this year. I mean what could go wrong if your planning to send yourself to your prospective business partners LITERALLY? Forget the cliche practice of sending your business cards around or mass mailing out your resumes. These don’t actually work when your competing with someone like Jens Lennartsson, a photographer with the killer idea. He decided to mail out toy figurines of himself to his potential business partners. And to make things seemed even more insane, he duplicated an army of them. As you can see from the picture above. He send them to magazines and other agencies who he think might hook him up for business. What particularly caught my attention was this dude actually went as far as to contact suppliers in China through Alibaba – China’s business to business site which is notable for their community of suppliers for providing you with almost ANYTHING you want. 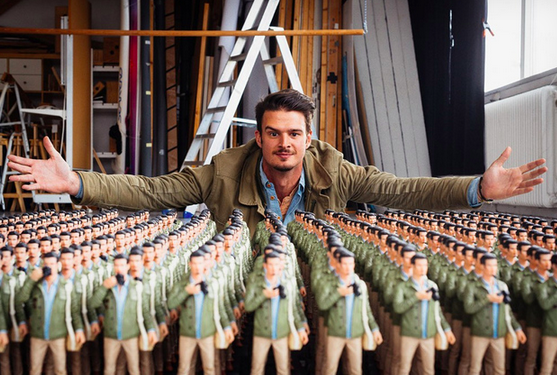 He apparently got one of the suppliers to give him some 400 dolls of himself, which he calls them “G.I Jens”. As much as I have to agree, these stuffs don’t come cheap and like the adage goes, no pain no gain. Let’s see if his return of investment is really going to bring him somewhere.